A team of Air Force Academy graduates, including Elliot, Hailey, Grogan, and Satterfield, is participating in a series of training scenarios at the SGC under Colonel O'Neill. Lapses of judgment among the young trainees are giving O'Neill cause for concern about the future of the program, just as his scenario is interrupted by an urgent message from Carter. There is a foothold situation at the SGC. An attack by SGC personnel is thwarted by O'Neill, but leaves him wounded, and no one can be trusted. It falls to the young recruits to overcome the alien incursion and restore the SGC. 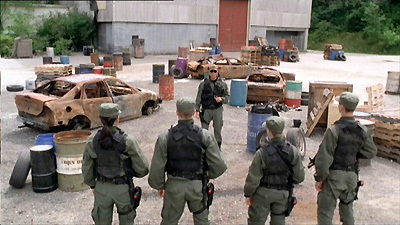 Using exterior access, O'Neill and his young team enter the SGC and establish a base in Carter's lab. There they witness Teal'c and Daniel, both under alien influence, in control of the facility, and they discover a mysterious alien device in the briefing room which seems to be a power source. They devise a plan to eliminate the device and deactivate the gate, but as the team prepares to launch its attack to neutralize Teal'c and Daniel, it becomes apparent that Hammond and the SGC are monitoring their progress. The foothold situation is part of a new training scenario. The alien device is accessed, but the explosive charge fails, and when the team reenters the room to investigate, they are greeted by the truth. The entire emergency had been staged. However, Hailey has remained behind in the gateroom, attempting to manually override control of the iris, just as deadly radiation begins to threaten the facility. An evacuation of the base is ordered, but Elliot risks his life to return for Hailey and to shut down the gate. He is successful, and finds himself being congratulated for the final phase of the training mission. The scenario is now complete. Or is it? The Air Force has begun a pilot training program to prepare young graduates to defend the planet. Every few months, several floors of the SGC facility are used to run training scenarios. A graduate must have the recommendation of an SG commander in order to be assigned to an SG team. Hammond is proposing an off-world training facility in next year's SGC budget. SGC training scenarios included rescuing captured team members, recovering alien technology, and neutralizing a foothold situation. O'Neill responds to the emergency call with “Sierra Gulf Niner, Code Foxtrot Alpha Six” Also “Confirmed, Foothold, Sierra Gulf Charlie”. The artifact used in the training scenario was a device with an inscription written in the obscure dialect found on the planet Argos, rough translation, “Gift From On High”, intended as a Trojan horse using (fictional) nanobots to infect SGC personnel to make them receptive to suggestions from the alien device. Carter’s lab is on sublevel 19. Daniel’s office is on sublevel 18. Lieutenant Elliot will be assigned to SG-17 under Major Mansfield.